Dental implants are your long-term solution for replacing one or more missing teeth – at any age. 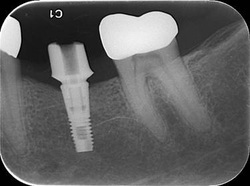 People continue to be curious about dental implants. Patients with missing teeth are pleasantly surprised at how much implants are like real teeth. 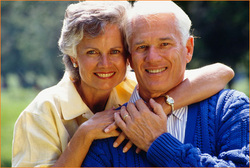 Dental implants look, feel, and function like your own natural teeth. With implants, you can eat, smile, and speak naturally again. All these benefits improve peoples' lives significantly. The implant process is effective and it is safe. The system we use has evolved over 25 years of documented research. 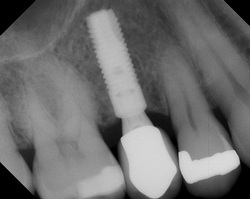 Implant systems may vary. 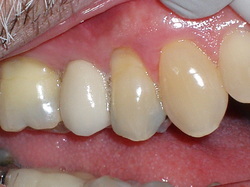 But for the right candidate, all systems offer better function than removable dentures. In order to gain information about surrounding teeth, bone and nerves, diagnostics are collected to ensure ideal implant placement. Tomographic or 3D images are taken to begin the planning process of your implants. Using Simplant technology Dr. Ford will plan your implants in a virtual surgery. The plan will be reviewed with you and your restorative dentist to ensure an optimal esthetic and function outcome. From this diagnostic information a surgical guide will be fabricated for your procedure. Scientific studies show that a three-dimensional plan, in combination with the use of a SurgiGuide®, will lead to an increased success rate for obtaining good natural esthetic results. This will be assured because the restorative plan was taken into consideration during implant planning. Complete information about the quality and quantity of the bone makes it possible for Dr. Ford to determine the ideal location for your dental implants. This will increase the probability for a successful operation. Knowledge of the exact location of important anatomy, such as the mandibular nerve and the maxillary sinus cavities, provide confidence that implant placement will proceed smoothly and safely. SurgiGuide® helps ensure that implants are properly placed, using all of this valuable information. The Surgical guide used during implant placement will help Dr. Ford to place your implants in the proper location, angulation, and depth avoiding nerves, the maxillary and nasal sinuses, and roots of other teeth. There are three stages used for placing a dental implant. First, during a surgical procedure, using the surgical guide, the implant device is gently placed into the upper or lower jawbone. This procedure is usually performed with local anesthesia. Other types of sedation, as in all dental treatment, are also available. 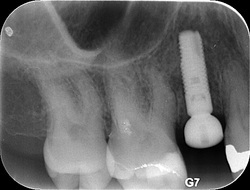 After a two to six months healing period, posts or healing abutments are attached to each implant. Lastly, your general dentist makes new teeth just for your face and mouth. 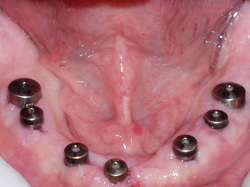 These teeth are secured to the posts(healing abutments). Your new teeth look just like your real teeth, as only the "tooth part" is visible. To be a good implant candidate, you need the bony ridges in your jaw to be in good shape and for your gum tissue to be healthy. Please call our office for an appointment or additional information. We will be happy to answer any questions you have regarding dental implants. Tooth #4 was extracted due to a fractured root. Bone grafting was done in order to prepare the area for a dental implant. Dr. Ford placed an implant in the #4 location. 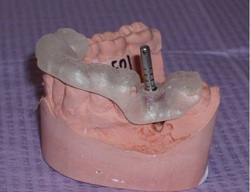 After a healing period of 3-6 months a "connector piece" called a healing abutment was attached to the implant. 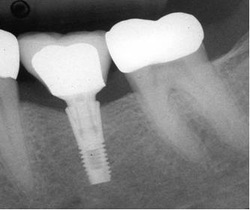 The patient's general dentist placed a crown onto the implant's restorative abutment. Routine follow up x-rays are taken to monitor bone around the implant. 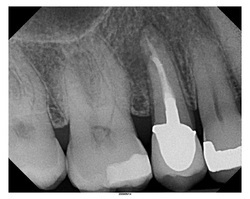 This x-ray was taken 2 years after implant placement showing healthy bone. 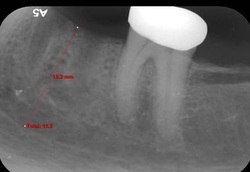 Follow up photo for tooth #4 taken 2 years after implant placement. The final result looks just like a natural tooth.